Nia Kaudo, C’18, explores the 20th-century policies that have led to mass incarceration in the U.S. and Brazil. 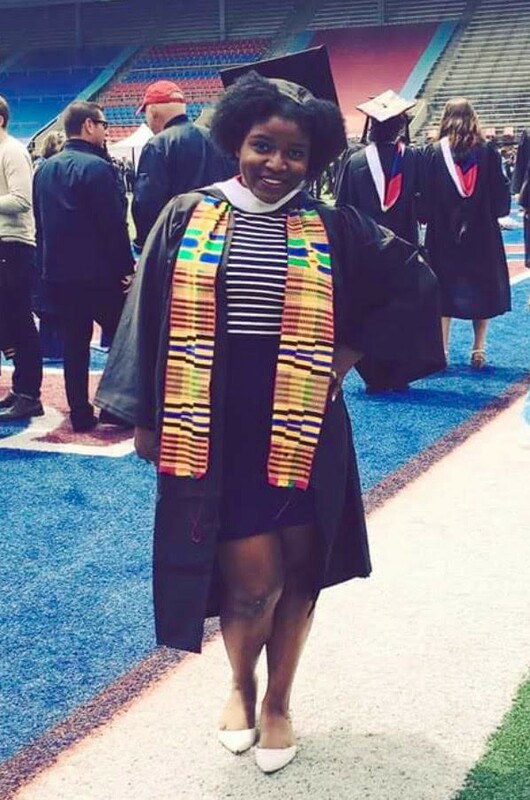 2018 College grad Nia Kaudo, a double major in Africana studies and political science with a minor in history, undertook summer research as part of Penn’s Jumpstart for Juniors program. Kaudo combined her academic interests to study the history and present-day status of incarceration in the U.S. and Brazil. Her project is titled Perpetually Bound: The Impact of 20th Century Policies on Black American and Afro-Brazilian Incarceration Rates. Here, we talk to Kaudo about Jumpstart for Juniors, her research, and her hopes for the future of mass incarceration policies. Why did you decide to apply to Jumpstart for Juniors? I'm really interested in research. I love history. I love both of my majors: Africana studies and political science. So, I really wanted to work with a faculty advisor who had similar interests, while doing my own independent research. Jumpstart for Juniors offers a summer of grant-funded research on a subject of the student’s choosing (as long as it is approved by the committee). It was a great opportunity going into my senior year and it was wonderful working with my advisor Michael Hanchard, Professor of Africana Studies, who is an expert on nationalism, social movements, racial hierarchy, and citizenship. I’m passionate about the topic of incarceration and I use that term very broadly. Professor Hanchard suggested that I think about doing a comparative project between the U.S. and another place within the African Diaspora. What was it about Brazil that made it a compelling comparison to the U.S.? Brazil imported 40 percent of the enslaved African people that came to the New World. So, they have the largest concentration of Black people in the world outside Nigeria. That's a little-known fact about Brazil. I was interested in investigating why this country—who claims to have what they refer to as a “racial democracy”—was actually among the top four nations in the world to incarcerate their own people. How did this happen? What policies led to this? How did you approach these questions? I used the lens methodology with the United States as the lens through which to look at Brazil. I looked at the policies I knew existed in the U.S. and tried to find policies that were either temporally or politically based on the same thing in Brazil. Drug laws are where I found the jackpot. It became clear why Brazil has such high mass incarceration rate; they implemented a lot of the same drug policies as the United States. What laws and policies did you focus on for the study? Starting from the post-abolition era, I investigated whether Brazil had a similar period to the United States, like a legislatively backed system of Jim Crow or a formal Reconstruction. Brazil had neither. They had more of a de facto system. They tried to separate Black people out by subsidizing the importation or the travel of European immigrants into the country. Black people, formerly enslaved people, were kept out of the workforce and segregated into urban areas that would later develop into the favelas—even though they were the people who had developed the country. I discovered that Brazil oftentimes sanctioned their own discriminatory actions by comparing itself to the United States. Because Brazil wasn’t necessarily openly lynching people or openly enacting laws that were explicitly racially discriminative, they could claim a higher ground. It was a more covert racism operating in Brazil. They claimed a position as a racial democracy, meaning that there is no race in Brazil because everyone possesses a degree of African ancestry; however, that negated the very real issue of colorism. How does colorism impact the Afro-Brazilian population? I discovered that the Whitening Thesis is in effect in Brazil. It’s a system of what sociologists like to call hyperdescent. Hyperdescent is the opposite of hypodescent, which we see in the United States with the one-drop rule, meaning that anyone with any degree of African blood or Black ancestry, is going to be called Black, regardless of their skin shade. In Brazil, it's expected that almost everyone has some degree of African ancestry. Hyperdescent means that if you are Black and you have a daughter with someone of European descent and she marries a White man and has children, and that line continues to get lighter and lighter, you’re reaching your goal to improve your standing in society. It meant endeavoring to wash out the Blackness in Brazilian society so that the country could be viewed as within the same realm as the “higher” European societies, like the United States and France, and places that really had this national image of being White countries. That was a concentrated effort by the Brazilian government, particularly through European travel subsidization and segregation. How did these discriminatory actions contribute to the disproportionate number of Afro-Brazilians in prisons? And then, how did the U.S. influence that? They created differences in housing, employment, and education opportunities. They also worked to create basically an archetype of Black Brazilians, African-descended Brazilians who are visibly darker, as being “dangerous Brazilians.” A dark Brazilian is someone who's just going to bring trouble, is unintelligent, and needs to be apologized for. And these are the people who were and are contained to urban favelas. They are out of sight, out of mind. One of the key points of my research is the idea that a lot of the countries that are considered on the periphery, like Brazil, adopt things that they see in core countries like the U.S. or other world powers. Brazil was under dictatorship until 1988. Once that ended, Brazil enacted a flurry of drug laws that mimicked the United States’ drug laws. The U.S. has declared their war on drugs in 1971, whereas Brazil started its imitation after the dictatorship and throughout the '90s. These laws equated traffickers with users. And then, in 2006, one of their largest drug laws was passed that did not set a minimum quantity of drugs to differentiate between users and traffickers, which led to a huge rise in the prison population—a 575 percent increase from 1990 to 2014. Beyond your research, you do additional work related to incarceration. Tell me about Beyond Arrests: Re-Thinking Systematic Oppression (BARS). BARS produces monthly articles about mass incarceration to raise awareness within the Penn community about the multi-faceted issues surrounding mass incarceration. We want people to see the impact that it has on American children, mental health, and families. We want to highlight recidivism rates, talk about solitary confinement and juvenile labor, and discuss the Trump administration's policies. We want people to understand the history and the landscape of mass incarceration. In addition, we recently started an after-school program in connection with Penn’s Netter Center for Community Partnerships at Comegys Middle School called “What is Mass Incarceration?” It allows a space for kids whose lives have been and are still being affected by mass incarceration to talk about it in a way that's not going to be shut down or stigmatized. Institutional racism is a massive knot that has been built over hundreds of years. Based on your experience, have you come to any conclusions about the potential for positive change? I hope my research will highlight the huge impact that drug laws have on Black populations, regardless of national boundaries. They’ve had a massive impact in the United States and Brazil, but also in the top 30 countries with the highest incarceration rates. The U.S. has a lot of influence on other countries’ policies. All of these countries have a history of colonialism and/or oppression of Black people. Adjusting those drug laws, decriminalizing certain drugs or use of drugs, stopping the equation of drug users and drug traffickers, reducing police presence in majority Black neighborhoods, and just fairness across the board, would go a long way. Additionally, I think a lot of people possess implicit bias, which is racism that they don't even recognize as racism because it's not overt. They're not necessarily calling someone a slur. But, at the end of the day, being complacent when you see something happen to someone because of their race makes you part of the problem. We need to reverse the part of our culture that accepts racism. I'm very much interested in and committed to studying mass incarceration. I'm hoping to work as a paralegal for a few years before going to law school. I'd love to go to Brazil and really dive into the background of slavery. I want to find out more about the dynamics of slavery, potential resistance among the enslaved people, and what the U.S. connection was with Brazil at that time.